In 1981 the American evolutionary biologist and historian of science Steven Jay Gould published The Mismeasure of Man, a blistering critique of ‘innate’ intelligence and of the idea that the intellectual (and hence social) worth of an individual – and indeed of whole groups of people – could be directly related to a measurable and fixed ‘intelligence quotient’ (IQ) or ‘general intelligence factor’ (g). However, despite this powerful assault on what had become almost an intelligence industry, many academics have continued to ‘refine’ and ‘extend’ the notion of innate intelligence and its testing regimes. In this powerful, exhilarating study, Dr Patrick Winn takes up the cudgel. For him, Gould simply did not go far enough in exposing the shaky foundations on which the ‘innate intelligence community’ bases its theories. He argues forcefully that ‘innate intelligence’ and its testing are not only dependent on poor and bigoted science but that they derive from a profound epistemological error. Intelligence, in short, simply does not exist – at least, not as an innate, unchanging given in an individual’s make-up. 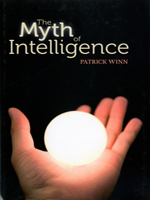 Meticulously researched and elegantly written, The Myth of Intelligence is a ground-breaking and important work – a battle cry for humanity and its educational potential.